Apps are everywhere these days and for wine lovers with Android and iOS devices the options are virtually endless. Which apps are right for you? That depends on whether you are looking for wine recommendations, or want to share your favorite vino virtually with friends. Maybe you're after tracking and cataloging your top sips or just want to know the lowdown on a particular wine - where it’s from, who made it and how much others like it. In any case, there are a slew of specific wine-themed apps ranging from regional helps to winery apps, and food and wine pairing to wine buying apps that promise to give you a wine buying, drinking, and pairing edge. If you’re looking for a way to make your wine nights a more fun and notable experience, we’ve got the right app for you. 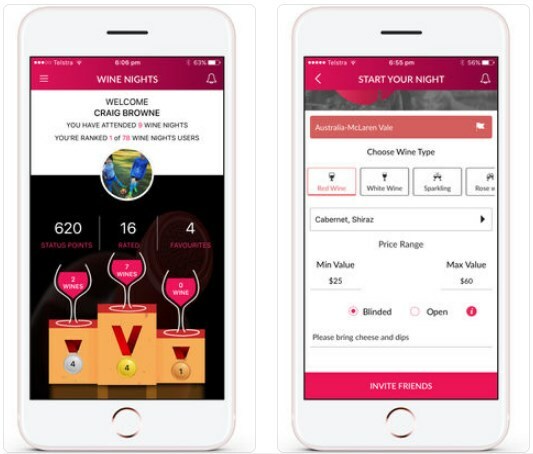 Welcome to WineNights, a cool cross-platform wine app that’s catered for both experienced wine connoisseurs and novices in the wine world. Whether you’re a regular wine lover that wants to keep track of his favorite wines or to organize fun wine nights with friends, WineNights has got you covered. If you’re a serious wine drinker or new to the wine world, you will make such a great use out of the WineNights app! User-friendly and simple, this app is full of features that will make your wine nights even more exciting. Easily start wine nights events and invite whoever you like, set the criteria for your night - venue, date, time as well as the country, region and wine variety, rate, enjoy and discover new wines, make your own collection of Favorites and store them in the app itself, challenge your friends to a wine night to finally prove who the true sommelier is, earn status points to see how you rank against everyone, taste and judge wines through the app to find out who is king among your friends, and a lot more. WineNights is an amazing app to have fun with wine and friends, so if you would like to try it, click one of the links below and download it right away – it’s free!